Hop-On Hop-Off Buses operate from: 8:30am until 5pm. The Original London Hop-on Hop-off operates daily throughout the year. 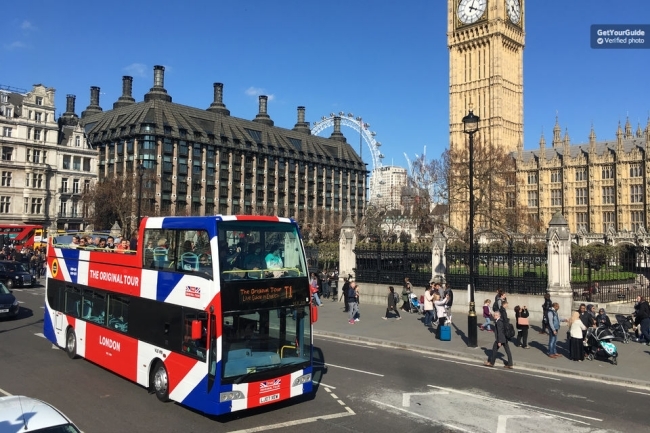 We are comparing The Original London Hop-on Hop-off Sightseeing Bus Tour Prices from leading ticket suppliers and Try to find you Cheap tickets prices on the market. This comprehensive package includes bus tours, walking tours and the Thames River cruise. The 3 Hop-on Hop-Off bus lines are an ideal way to explore the city of London and see its iconic landmarks. With 3 available walking tours, you get a deeper insight about changing of the guards, Rock 'n' Roll and London from times of infamous Jack the Ripper. In addition, you get the opportunity to enjoy a pleasurable cruise along the Thames River. During the bus tour, you can chose your preferred language and listen to the onboard audio guide to learn some interesting facts. Among other places of interest, you will see the Westminster Abbey, the London Tower, the Saint Paul's Cathedral, Piccadilly Circus, Trafalgar Square, the Big Ben and the London Bridge. This introductory tour is especially convenient for first-time visitors to London. Also, this service provides fast transfers between points of interest throughout the capital of the United Kingdom. Your Experience With The Original London Hop-on Hop-off Sightseeing Bus Tour? Get yourself acquainted with the capital of Great Britain in an efficient and convenient manner. Take a ride that will introduce all the top attractions of London and listen to the onboard audio commentary as you pass the places it tells you about. Choose whether you like to complete the full loop or prefer to make stops along the way. Feel free to hop off and on at any stop you like and continue the sightseeing tour later. Along the way, you will see Piccadilly Circus, Westminster Abbey, Big Ben, the Houses of Parliament, Tower Bridge, Trafalgar Square, the London Eye and many more top London attractions. Also, you will join three walking tours of London for gaining in-depth knowledge about the city. Finally, take a pleasant cruise on the River Thames. What The Original London Hop-on Hop-off Sightseeing Bus Tour Includes? Unlimited 24 to 48 hour access to the Hop-On Hop-Off City Sightseeing Bus (depending on option selected). Three free city walking tours and a complimentary river cruise. Unbiased comparison of London's Best Hop-on Hop-off Sightseeing Tours operators(London Original Bus Tours vs London Big Bus Tour vs Golden Bus Tours) based extensive research, Tripindicator team came up with comprehensive recommendations for Family, Couples and Single travelers which helps you choosing Best London Hop-on Hop-off Sightseeing Tour suitable for your travel. Unbiased comparison of London's Best City Passes /Discounts Cards(London Pass vs London Explorer Pass vs London City Pass Vs iVenture Card) based extensive research, Tripindicator team came up with comprehensive recommendations for Family, Couples and Single travelers which helps you choosing Best London City Pass suitable for your travel. With the Original London Sightseeing ticket, you benefit of discounts at multiple attractions in London. For individual attractions, you pay around 20% less while the discount rises up to around 40% for packages. Travelers Reviews about The Original London Hop-on Hop-off Sightseeing Bus Tour? Travellers give this your 4.5 out of 5 on Get Your Guide and Viator, and 4 out of 5 on TripAdvisor. The comments posted by tourists indicate that you can see a lot in one day and almost everything in two days. Many of them spoke commendably of the guide. Hop-On Hop-Off London Sightseeing are all wheelchair accessible. You must bring either an electronic or printed voucher for this activity. Every provider has a different cancellation policy. With some of them, you can count on a refund for cancellations made in advance. Buses depart on regular intervals, but they may occasionally need longer time to reach stops because of traffic. On Christmas, there are no bus services. Your ticket is valid for 24 or 48 hours from its first use. For instance, if you take the first ride at 1pm on this day, the ticket is valid until 1pm tomorrow or the day after. The three available walking tours are: Jack the Ripper Walk, Changing of the Guard Walk and Rock 'n' Roll Walk. You can join the bus tour at any of the marked stops along the route.